“The temperatures are dropping and we have to start moving,” I said the morning of day 2. We had no idea of the conditions that awaited us, but we knew we had to do what we could to keep warm. 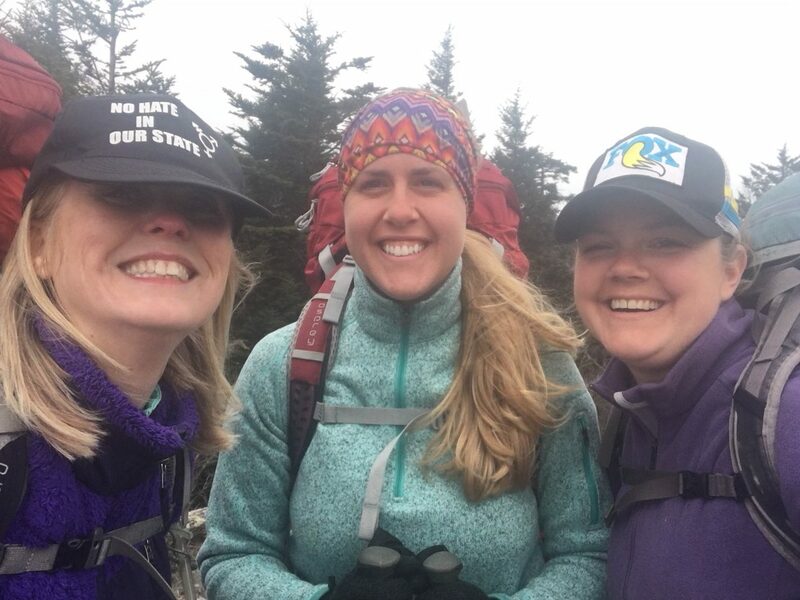 This past weekend my friends Jessica, Laurie and I decided to do a section hike of the Appalachian Trail. When they arrived at my house, Jessica mentioned that there was snow in the forecast. We all looked at each other and with confidence said, “No problem. A little snow doesn’t scare us!” From my experience, snow in North Carolina is so minuscule compared to the snow I grew up with in New Hampshire. How bad could it get?! So we hopped in two cars and drove 1.5 hours. 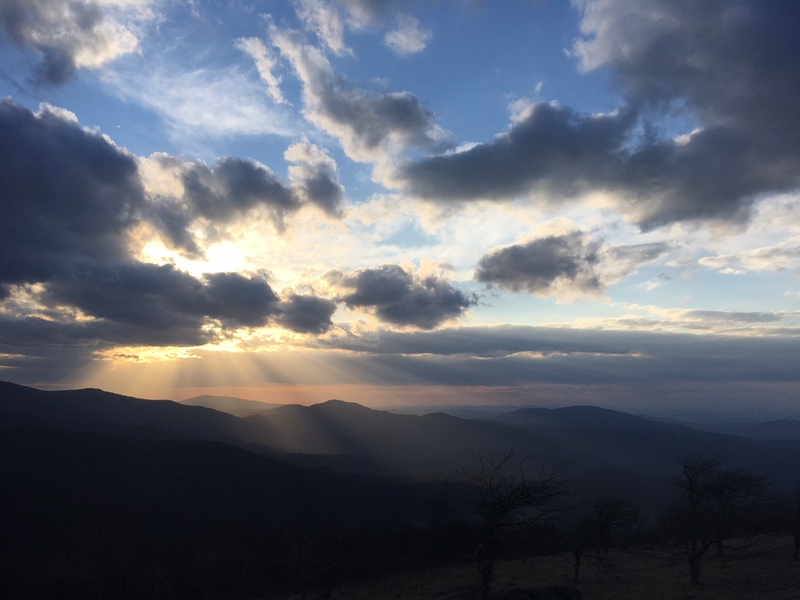 After setting shuttle, we drove another half hour to Carver’s Gap outside of Roan Mountain, NC to start our trek. At the trail head, I slung my 33lb pack on my back and proceeded to verbally exclaim my excitement for the adventure. (!!!) The weather was impeccable, in the mid-60s and partly sunny. 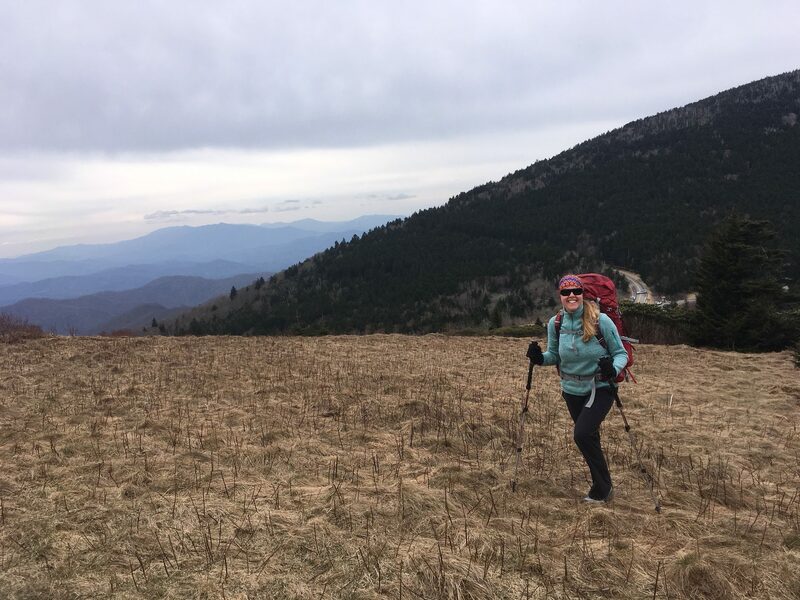 We began our northbound hike up to Round Bald (elev. 5286ft) and were greeted by magnificent views. Along the way we passed pleasant day hikers and further into the hike, were graced by Space Rock, a 50-something year old man who started the AT at Springer Mountain in GA on February 16 and was planning to make it to Maine by Labor Day. Meeting Space Rock felt the same as meeting a celebrity. I am in awe of people who pursue this challenge and have so much respect for their determination. After making it up and down several hills totaling 9 miles, we settled on a spot to camp in an area called Bradley’s Gap. We set up our tents and got dinner going-a delicious chicken pesto pasta. After dinner, I decided to check out what was beyond the crest of the hill near our campsite and discovered one of the most captivating sunset views. I spent a while up there connecting with our Creator and marveling in the silence of my surroundings. That night, we made friends with the 4 other backpackers that shared our site. We exchanged stories and laughs over a bottle of malbec and got to witness Joaquin, an Argentinean man, eat his first s’more! We kept the fire and conversation going until about 11:00pm and then headed to bed. At approximately 1am, everything shifted. At first the precipitation was sleet in form, but then quickly changed to heavy rain. I noticed the forecast showed that temperatures were going to continue to drop into the night and they would be around 30 degrees in the morning. As I laid there unable to sleep, small drips of water began landing on my face. I tried to ignore the fact that the lightweight tent I borrowed from a friend may not be able to withstand a night long rain storm. As each hour passed, I noticed my down sleeping bag begin to get a bit damp and around 6am there were puddles of water collecting in my tent. It took conscious effort to keep my gear from getting wet. I proceeded to try to soak up some water in a few babywipes, but the coldness of the water and temperature of the air, froze my hands instantly. 7:30am rolled around and I decided that we needed to get out of there as fast as we could due to dropping temps, my wet gear and the need to move our bodies in order to stay warm. I informed my friends of the situation and we hurriedly disassembled our tents and shoved them into our packs. The trails were muddy from the overnight rain and the winds picked up significantly as we entered the fully exposed ridge line. We were met with a full on snow squall that left us feeling uncomfortably vulnerable. 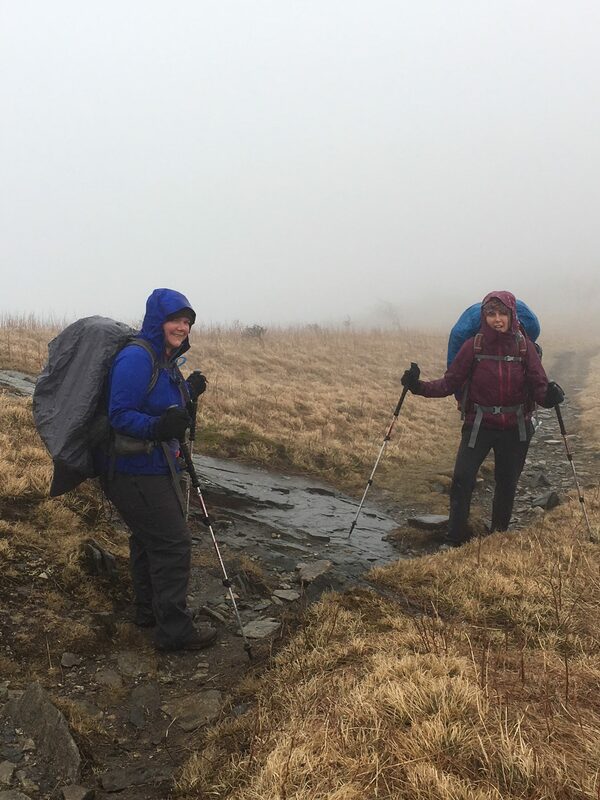 The high winds forced the sleet to stick to our clothes and we fought to keep our footing. The highest peak of the trip was ahead of us- Hump Mountain (elev. 5587ft). We used the support and encouragement of each other along with my own personal prayers and frequent cus words to get us to the top. After about an hour, we reached the top and proceeded down the other side where the winds subsided for a brief moment. The inclement weather persisted and stuck by our side, literally, for another mile or so. We eventually made it to the tree line on the other side and were able to get a break from the aggressive conditions. We hiked over slippery rock gardens, slid on some mud and crossed over tiny creeks. The snow continued to come down, but this time it was different. The contrast in weather from moments before was astounding. The trees shielded us from the winds and we were calmed by the sweet serenity of soft snow falling delicately on the forest floor. The temperature of the air and the wetness of our gear was still a concern. After two hours into the second portion of the trek, we decided to stop for a quick bite to eat since we didn’t have time to fix breakfast that morning due to the urgency to get moving. I removed my wet gloves and devoured my peanut butter and jelly sandwich. Jess reminded us that we needed to continue to move to keep warm and kept us focused on getting to the end. I put my gloves back on and quickly realized that it was a bad idea to have ever taken them off. Despite them being wet, they had been keeping my hands at a safe temperature, but as soon as I exposed them to the freezing temps, they became unbearably cold and I found myself panicking to figure out how to regain their warmth. Jess advised me to place them close to my skin on my stomach and then thought of the idea to use my extra socks as gloves. Thank goodness, it worked. With socks on my hands and Laurie’s positive outlook, we continued on in anticipation of when the trail would lead us to our final destination-Laurie’s car! We passed by beautiful boulders and snow kissed rhododendrons. Our bodies were sore, cold and in pain, but there was no other choice except to push forward. Moments later, we began hearing distant sounds of car tires on a nearby road and grew hopeful. A mile or two more and we’d be there. When we caught a glimpse of Laurie’s car in the distance, we let out an exuberant cry! We used the last bit of energy we had left to get us to her car. Waves of gratitude came over me as I realized that we had made it through. A group hug was in order. We removed our packs and placed them in the back seat. The feeling of warmth coming from the air vents in the car put my soul at ease. It was if I was experiencing it for the first time. As we began reacquainting ourselves with modern conveniences, we decided our first stop would be at the local store to treat ourselves to a hot chocolate. The sweet, chocolatey warmth coated my soul and provided me a sense of peace that we had made it. It was a wild journey-an epic one at that. 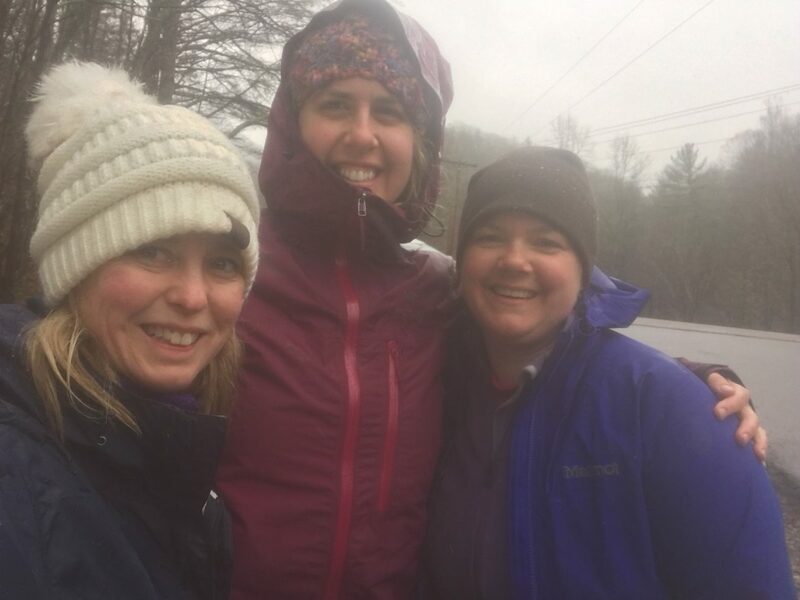 An experience that not only taught us to take weather reports a bit more seriously, but about how important it is to be there for one another. I am so used to doing solo trips, but found that having these women by my side made me feel motivated, safe and cared for. I am so grateful for their presence and encouragement on this trip. I will forever remember this excursion and look forward to the ones to come. I love this, Erica! And I am beyond grateful that you and Laurie were on this hike with me! We made a fantastic team and I cannot wait for our next trip!